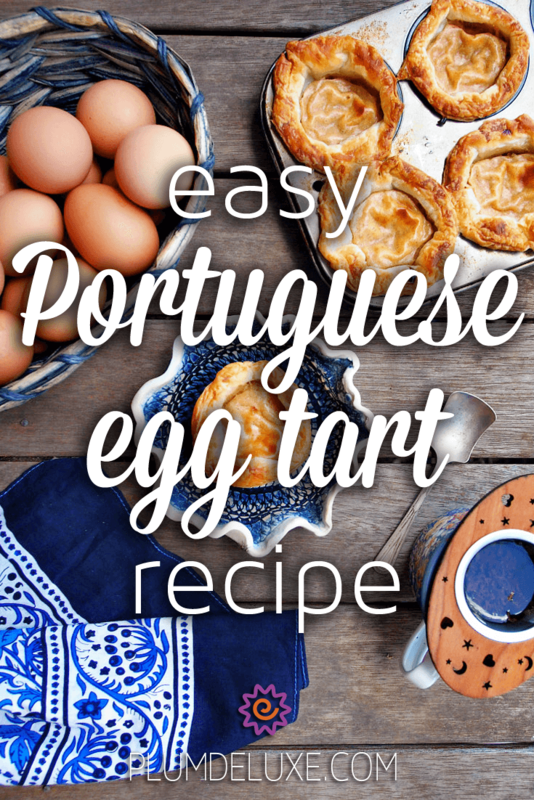 Anything that includes egg custard is pure comfort food to me, and when it’s encased in a buttery puff pastry like our easy Portuguese egg tart recipe, the comfort level goes through the roof. Portuguese egg tarts (pasteis de nata) are a specialty of Portugal, a rich egg custard nestled in a delicate pastry and baked in an oven so hot that the pastry becomes shatteringly crisp and the custard is beautifully blistered. While most of us don’t have ovens that hot, we can still make a successful version with careful use of the broiler. 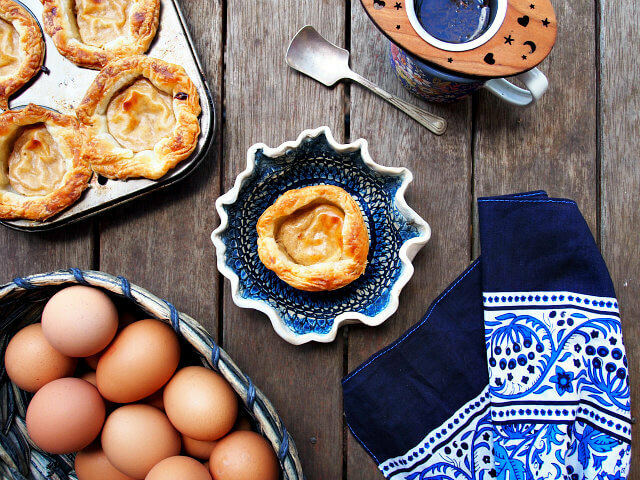 This delicious and easy Portuguese egg tart recipe starts with a baking tin. 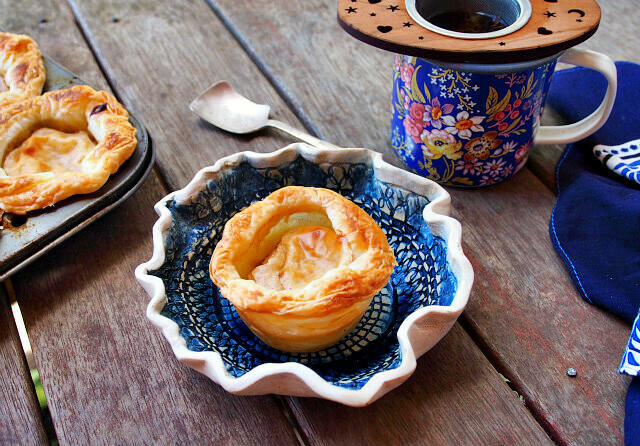 In Portugal, egg tarts are made in individual mini-tart pans which allow for even browning on all sides. 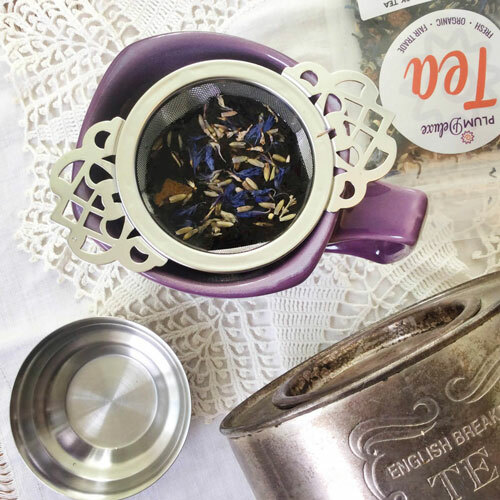 For those of us without a stash of these specialized tart pans in our kitchen cupboards, we can make do with a muffin tin. Just be sure to rotate it once during the baking process so browning is consistent, and use a fan-forced oven if possible to ensure the heat is distributed well around each cup. 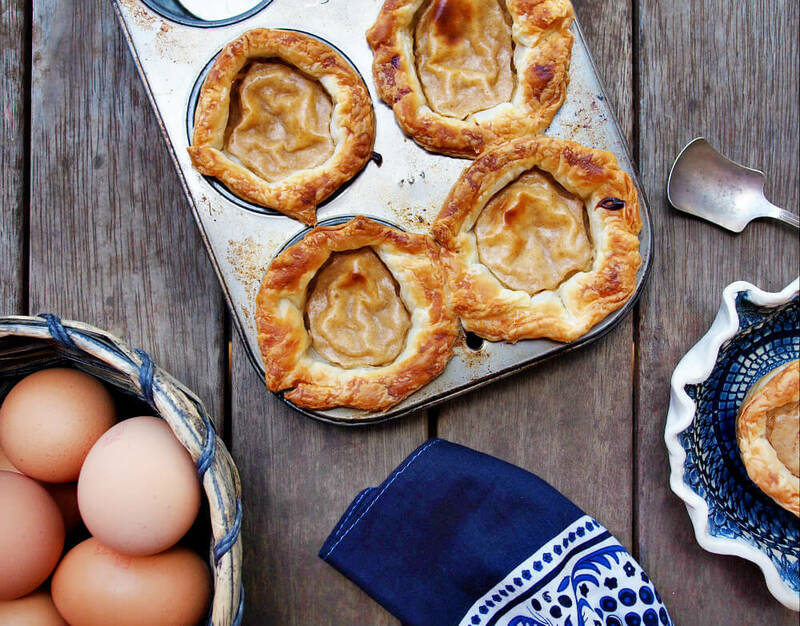 While it is fun to make pastry from scratch, Portuguese egg tarts can be made well with store bought puff pastry so long as it’s made with real butter. The butter does make all the difference in this dessert, and is well-worth the extra expense. Rather than cutting out circles of pastry and pressing them into each muffin tin, the puff pastry is cut into strips and pressed into the tins in a spiral pattern that looks quite beautiful when removed from the tins after baking. The trick to getting a crisp, flaky crust for these tarts is to chill the dough well after it’s been pressed into the tins. This will return the butter to a solid state and make for better crispy layers that shatter beautifully when you bite into the tarts. Portuguese egg tarts have a lusciously smooth filling that is sweetened by a spiced sugar syrup rather than granular sugar. 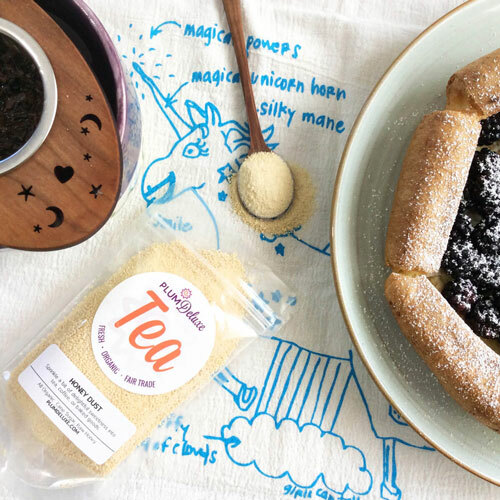 The sugar syrup is simmered with a whole cinnamon stick before being mixed into the custard, providing a heavenly scent that fills the whole house during the baking process and makes each bite a fragrant pleasure. It is rarely a good thing to leave anything baking in the oven so long that it turns black, but that blackening is essential in this easy Portuguese egg tart recipe. The blistered tops are a distinctive mark that set these tarts apart from their custard cousins. They provide a wonderful burnt caramel layer that goes wonderfully with the smooth custard underneath, much like the melted sugar topping of a crème brulee. If you don’t have a commercial oven that will blast your tarts with heat sufficient to blacken the tops and crisp the bottoms, turn to your trusty broiler for the last few minutes of cooking. Just be sure to keep a close eye on things so you don’t end up with burnt pastry. 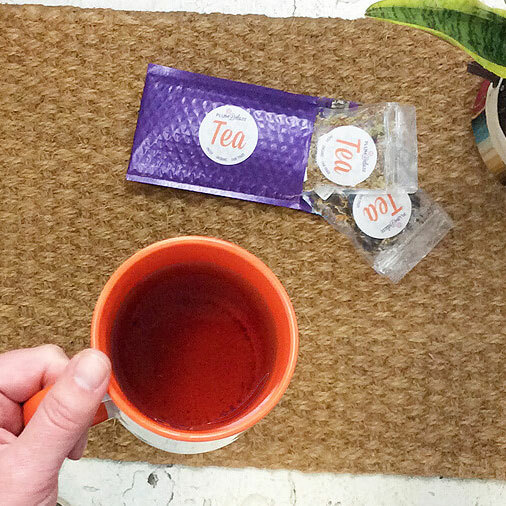 I like to serve warming teas with Portuguese egg tarts. 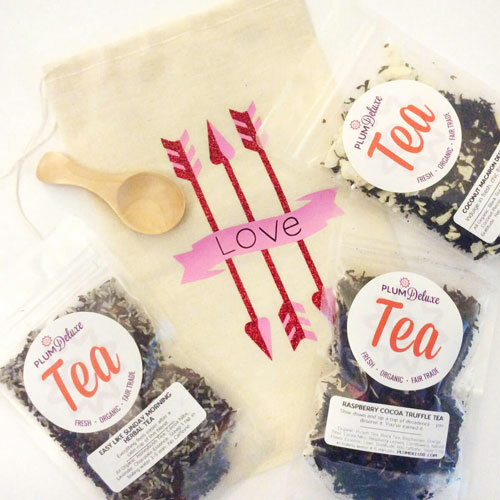 Our Sweet Spot butterscotch black tea and Caramel Almond black tea are excellent choices, as are Vanilla Latte, with its hint of cardamom, and the Coconut Ginger Soother herbal tea. In a heavy-bottom saucepan, combine sugar, water, and cinnamon stick and bring to a boil over high heat. Cook for one minute, then remove from heat and set aside. Lightly flour counter, then lay out puff pastry sheets and cut into 1/2-inch slices. Take one strip and press one end into the center of each muffin mold, pressing into a spiral pattern, adding more strips until bottom and sides of each mold are covered and a 1/4 inch of dough extends above each rim. Refrigerate about 10 minutes. While pastry chills, place 1 cup of milk into a small saucepan and cook over medium heat until bubbles form at the edges. Remove from heat. In large bowl, whisk together flour and remaining milk until smooth, then add hot milk, stirring constantly. Remove cinnamon stick from sugar syrup and add the syrup to the milk mixture, whisking constantly until smooth. Pour mixture back into the heavy-bottom saucepan and cook over medium-low heat, stirring constantly, until mixture thickens. Once mixture is thick, add the egg yolks, whisking constantly. Pour through a fine-mesh sieve, then pour 1-2 tablespoons into each pastry shell. Bake 15-20 minutes, turning pan once, until shells are browned and crisp, custard set, and the tops blistered. If necessary, turn broiler on for the last few minutes of baking so the tops blacken well. Let tarts cool in pans about 5 minutes before removing to cooling racks. Sprinkle with cinnamon and serve warm.